As 8-year-old Jesse-Cole Shaver, his 14-year-old sister Jasmine and a few of their friends wandered along a creek behind their apartment complex in Oregon City, Ore., Tuesday, one of the kids stepped on a rotten log. A swarm of bees flew out and started stinging the group. Jesse-Cole was stung more than 24 times. When his Pit Bull, Hades, saw what was happening, she raced to him. “Hades saw me and came, and she dragged me up to the grass, and then stopped and let me crawl on her back, and then took me to mom,” Jesse-Cole told KPTV. His sister Jasmine, who is deathly allergic to bees, was stung more than five times, and had to be treated with an EpiPen. “It felt like a bunch of needles went into my skin, and I didn’t know what was going on until the girl started yelling, ‘Bees! '” she told KPTV. She took her kids to a hospital, where doctors found even more bees in their hair. Jesse-Cole and Jasmine were treated and released after a few hours. Hades was also stung a few times, but is doing fine. 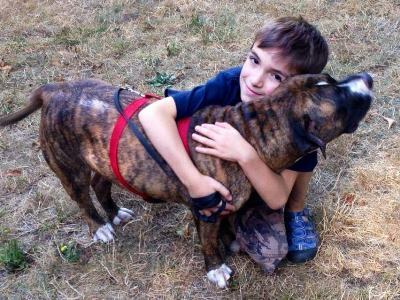 If the rescued hero dog hadn’t come to her family’s rescue, “a couple of these kids could have got really sick or died, I’m sure of it,” the mom told KPTV.